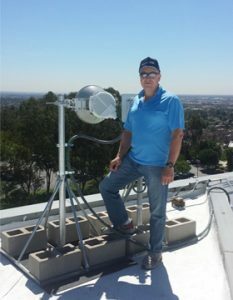 Cable AML has recently installed a high capacity IP link operating in the 24 GHz “licensefree” to provide backhaul connectivity between two major facilities near the Los Angeles International Airport, in Los Angeles, California (USA). The microwave link was the wireless leg of a completely updated network interconnection project designed and installed by Cable Masters for a Corporate customer. Cable Master is a California company with state-of-the-art capabilities in the design and construction of wired and wireless projects worldwide. The 24 GHz IPLINK is able to provide 750 Mbps (full-duplex) which enabled Cable Masters to provide seamless connectivity between two major network nodes which were difficult to interconnect by fiber. According to Cable Masters Vice President Hiroki Shimamura, “this wireless link has made it possible to robustly interconnect two network nodes with maximum efficiency without having to recourse to a very costly fiber run. Cable AML’s equipment and service has made the installation easy and has made it possible to save significant time and cost on the overall project”. Cable Color, the leading Cable Operator in Honduras, has recently installed a Gigabit microwave link covering a distance of 70 Km over the ocean. The link provides ultra-high capacity IP connectivity between the mainland and the island of Roatan, off the coast of Honduras. Operating in licensed bands, it replaces older lower capacity links that were operating in the license-free band but that were prone to downtime due to interference and other issues. With a capacity of 1.5 Gigabits, the full duplex link can be operated in the “link aggregation” mode or in the hot-stand by mode depending on traffic conditions. Cable Color performed the installation and commissioning of the link, including the mounting of 2,4 meter diameter antennas at a tower height of approximately 80 meters. 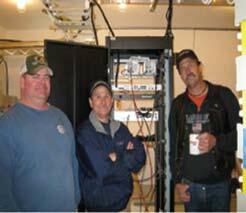 When Time Warner needed to increase data transmission speed between its headends at Libby and Troy, Montana, Cable AML came up with the perfect solution. 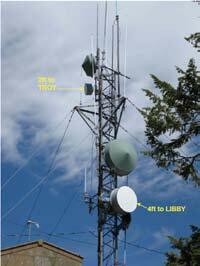 Cable AML designed an 18GHz bidirectional transmission system between the Libby and Troy headends through a repeater site on King Mountain. The previous system data interconnect delivered a capacity of 24.7 Mbps, transmitted over sixteen T1 lines. The new transmission system provides a rate of 80 Mbps and can be increased to 155 Mbps by changing the modulation format through a software upgrade from 16QAM to 256QAM. King Mountain posed a more formidable challenge than spanning the 18 mile distance between the two headends. The 4,160 foot high mountain stood directly between the two microwave towers. Dense forests of mostly mature, fir trees covered the high and low lands in between. In addition, snow and ice accumulations remain on the mountain for much of the fall, winter and spring. “Even in June the weather impedes access to the King Mountain site, so the job was completed in July after clearing some of the trees that were blocking the path”, said Ted Chesley, Sr. Microwave Field Engineer. US Cable Operator Time Warner has recently installed a 6 GHz licensed IP microwave link (IPLINK) between the top of Haleakala mountain and the city of Hana. The link is an upgrade of an existing 5.8 GHz spread spectrum link to improve high-speed data (HSD) service to the city of Hana on the island of Maui (Hawai, US). 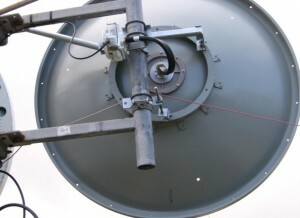 Cable AML performed the link analysis and provided the electronics, antennas, and related hardware for this project, as well as alignment and turn-on engineering assistance. The link to Hana from atop the Haleakala volcano is challenging due to the long distance and the fact that there is no direct LOS (line of sight). The connection is established via a double passive reflector (billboard) in the path. Time Warner is using the same reflector and path to transmit signals at 13 GHz, 18 GHz and now 6 GHz, all implemented with Cable AML systems. The isolated town of Hana receives Cable TV signals (54 to 870 MHz) from the main Headend in Maui. The transmission path starts with fiber to the top of Haleakala, from where it is transported via 13 GHz and 18 GHz broadband microwave links. Microwave is the only feasible and economical way to serve this small community. The 6 GHz IP Link provides a return path for the subscriber cable modems. 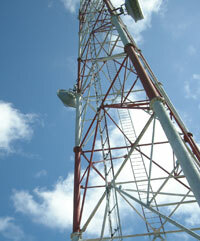 A Gigabit microwave IP Link has been installed in Honduras covering a distance of 70 Km over the ocean. The link provides ultra-high capacity IP connectivity between the mainland and the island of Roatan, off the coast of Honduras. 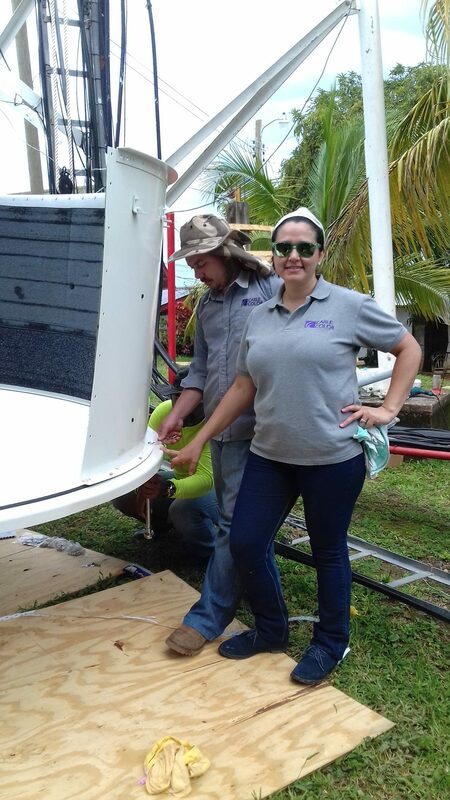 Operating in a license band, the link significantly increases the total wireless capacity between the mainland and Roatan. With a capacity of 900 Mbps full duplex, the link has been in operation for several months with good performance. The link was installed and commissioned by the customers’ technical personnel, under Operations Manager for North Zone, Eng. Wendy Romaña, Head of Operations for Cable Color. 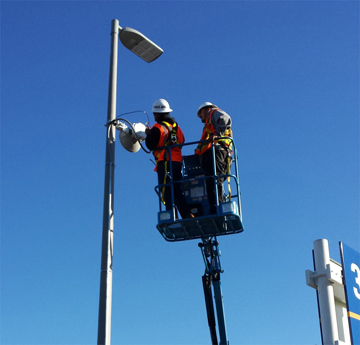 The installation included mounting and pointing the 2.4 meter diameter antennas and performing validation capacity testing. According to Eng. Romaña, “the link performance is meeting our expectations and we are looking forward to further expand the scope of services to our customers”. 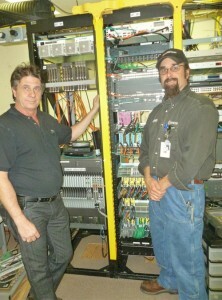 Cable AML recently installed two high capacity microwave IPLINKS operating in the 24 GHz “license-free” band. 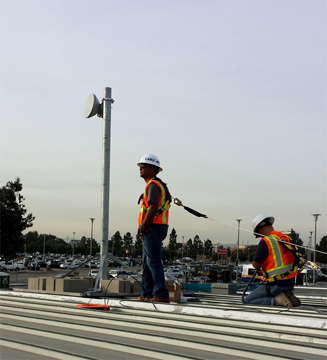 The first link was installed in the East L.A. College Campus (in Los Angeles, California) to provide connectivity between two points at a distance of approximately 1 Km. The link is designed to provide high-capacity point to point connectivity within the campus. With a maximum capacity of 750 Mbps each way, the full duplex link has the ability to operate in programmable channel sizes from 10 MHz to 60 MHz bandwidth. The actual operating frequencies are also programmable within the band. Squaw Valley Ski Resort in Olympic Valley, California, is one of the largest ski areas in the United States. It was the site of the 1960 Winter Olympics. 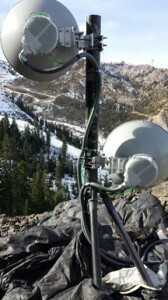 Squaw Valley uses fiber to provide WiFi internet access as well as essential services to the upper portions of the mountain, namely at High Camp Lodge and Gold Coast lodge. The company lost 80% of the fiber capacity due to unforeseen seismic activity which damaged the fiber cable. Due to strict environmental regulations which prohibited underground digging until summer, the company needed a quick solution to provide back-up connectivity in case they completely lost their fiber. They contacted Cable AML to see what could be done in a very short amount of time. Using the 24 GHz license-free band IPLINK solution, Cable AML with the invaluable assistance of Cable Master was able to procure, install and provision three IPLINKS which connected the upper portions of the mountain to the main lodge. The complete project was completed in seven days. 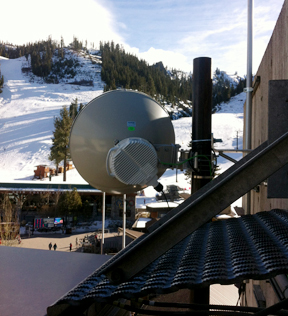 The 24 GHz IPLINK is able to provide 750 Mbps (full-duplex) which enabled Squaw Valley to confidently head into the winter holiday season with a reliable fiber back-up in case the remaining fiber connectivity was completely lost. 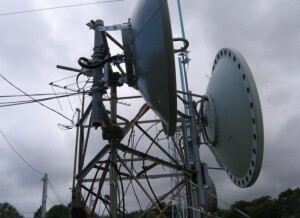 Telecommunications Operator Southern Cable Network Ltd. recently installed and is now operating a high capacity microwave IP link connecting Arcos (Guatemala) with Punta Gorda (Belize) through a relay point in Puerto Barrio (Guatemala). The high-performance IP Links (spanning 52 and 12 Km respectively) carry traffic at a rate of 165 Mbps each way (330 Mbps aggregate). 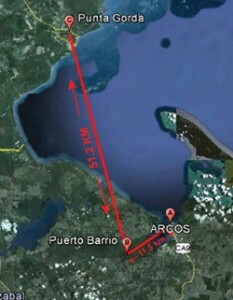 The long distance Punta Gorda to Puerto Barrio link is a fully redundant (1+1) link configured with space diversity to overcome possible multipath fades over water. The Arcos to Puerto Barrio link is also redundant (1+1) in a hot-standby configuration. The links were installed in 2011 by SCN personnel and have been operating with high reliability and availability since then. They operate with 256QAM modulation in 30 MHz channels within the 6 GHz licensed band, replacing older lower capacity links in the 5.8 GHz band. The radios are software-configurable and can be upgraded to higher data rates (up to 319 Mbps in a 50 MHz channel) by upgrading a software key. Comcast, the leading Cable Operator in the US, recently installed and is now operating a high capacity microwave IP link connecting the towns of Vacaville and Rio Vista in California. The high-performance IP Links carry traffic at a rate of 750 Mbps each way (1,500 Mbps aggregate). The link was installed by Comcast with Cable AML assistance and has been operating with high reliability and availability since the commissioning. The link normally operates with 256QAM modulation in 2 X 56 MHz channels within the 18GHz licensed band. It replaces an older 18 GHz link with lower capacity. The radios are software-configurable and can be upgraded to higher data rates by activating software keys.